These days, there arent that many places you can go to escape seeing Iron Man - the armoured avenger is everywhere. Heck, the old lady next door to you probably has Iron Man bedsheets! 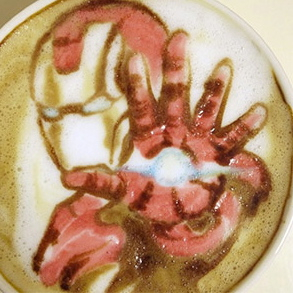 In fact the only place you can avoid his emotionless mask of justice is by staring into a cup of hot comforting java... or at least that used to be where you could go, until Japanesse coffee artist Nowtoo Sugi did this frothy number on the left. How does Nowtoo get such a red? Well watch this vid that takes you behind the scenes of Nowtoo's other pop-culture tastes, just by licking... umm clicking, play. I'd feel bad drinking it, though. But it's high in iron... sorry had to say it at least once! I'd try it Random, but mine would probably come out looking more like Swamp Thing! All I want to know is does it taste good.